Just in the last month, the faith-based drama “I Can Only Imagine,” which cost $7M to produce, has earned over $58M at the box office. This past Easter Sunday, NBC’s “Jesus Christ Superstar Live” earned both good reviews and won primetime for the night. But if one looks, Christian values can be found in many places, including both faith-based projects and secular ones. The purpose of the annual Christopher Awards is to recognize these efforts. First presented in 1949, the Christopher Awards were established by Christopher founder Father James Keller to salute media that “affirm the highest values of the human spirit.” Their goal is to encourage men, women and children to pursue excellence in creative arenas that have the potential to influence a mass audience positively. Award winners encourage audiences to see the better side of human nature and motivate artists and the general public to use their best instincts on behalf of others. All the 2018 awards can be found here. In a world where there’s a lot of anger and division, people need stories like those we’re honoring with Christopher Awards this year. From heroism in war to ordinary acts of kindness, these stories can serve as instruments of grace, helping us to see beyond our differences and celebrate our common humanity. ABC News 20/20:Wonder Boy follows the Newman family as they deal with their son Nathaniel’s rare cranio-facial condition called Treacher Collins, the brutal surgeries he must endure as a result, and their efforts to help the world see his beautiful heart, mind, and soul. The mini-series The Long Road Home (National Geographic Channel) dramatizes the 2004 ambush of the U.S. Army’s First Cavalry Division as they started peacekeeping duties in Sadr City, Iraq, the anxieties of their families back home, and the sacrifice and heroism of ordinary soldiers. In The Christmas Miracle, an episode of the long-running comedy series The Middle (ABC), Frankie Heck’s [played by Catholic star Patricia Heaton] adult son Axl refuses to attend church with the family on Christmas Eve, causing her to confront her own lackluster spirituality and recognize the importance of connecting with God. The Music of Strangers (HBO) celebrates the unique sounds and individuals that make up cellist Yo-Yo Ma’s Silk Road Ensemble, a group of musicians from the U.S., Europe, Asia, and Africa, who blend their musical cultures in order to build bridges in a divided world. POV: Swim Team (PBS) highlights Michael and Maria Quay’s efforts to give their son and other young people with autism the opportunity to achieve goals and gain confidence by channeling their energies into sports in an inclusive and encouraging environment. With a Nazi invasion of England imminent, newly appointed Prime Minister Winston Churchill [Academy Award-winner Gary Oldman] must rally his unprepared nation and fellow members of Parliament to fight for liberty and freedom in Darkest Hour (Focus Features). A rebellious and insecure teen, who has a contentious relationship with her mother, strives for independence and experiences moments of grace due to the subtle, unrealized influences of her Catholic education in Lady Bird (A24 Films). 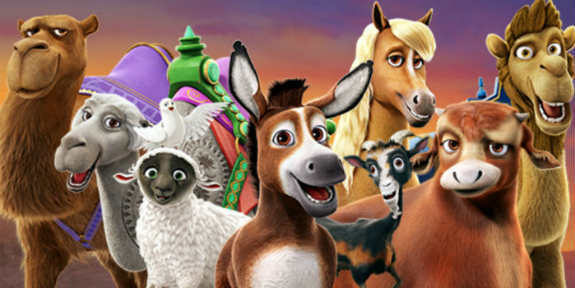 A brave donkey, lovable sheep, and wisecracking dove make up the merry band of misfits on a divine mission to bring Mary and Joseph to Bethlehem for Jesus’ birth in the animated Nativity story The Star (AFFIRM Films/Sony Pictures Animation). Based on the Christopher Award-winning bestseller, Wonder (Lionsgate) tells the story of a 10-year-old boy, born with facial deformities, who enters a mainstream school for the first time and teaches his classmates and community about compassion, acceptance, and the power of kindness. The 69th annual Christopher Awards will be handed out in New York City on May 17.